It's been a busy month and I've been cooking up a storm. Now it's time to blog about some of this! When friends from Washington were visiting, I made pork in mole (pronounced mo-lay) sauce but I had try it with a northwest spin. I've been working on my mole sauce for a long time but this one turned out nice and it was simpler than most I've tried. The slow-cooker takes a lot of the work out of it. Mole sauce, while complex, isn't all that tough to make and it gets better with time. A quick check online will produce more recipes than I imagined but there are some ingredients that stay the same; nuts, chile peppers, and something sweet are the basic 3 but there's room for creativity every step of the way. For this recipe I used Oregon hazelnuts instead of almonds (or peanuts) as the chief thickener. I used dates instead of raisins and sunflower seeds instead of sesame. Even the pork was a northwest original. I chose fresh pork that's sustainably raised and fed with GMO-free feed. In this case, it came from Tails & Trotters, noted for finishing the feeding process with hazelnuts. How perfect is that? Many thanks to Mike Wooley, from Long's Meat Market, for working with me. Most butchers are used to questions about the quality of the meat, and they routinely work with the size of each piece (they had to fit in the slow cooker) but he didn't miss a beat when I told him that it needed it to be photogenic, too. I gave this one a 'difficult' rating but it's not hard to do, just complex. There's a lot of tasting as you go and it helps to know what you like. 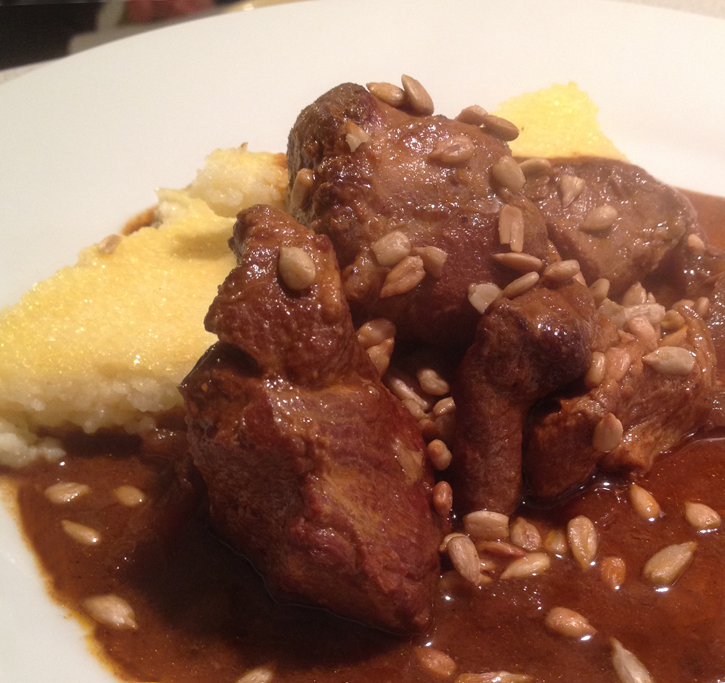 If you've never made mole before, consider this one a worthwhile adventure in the kitchen.